Anarcho-syndicalism might be said to have arrived in Ireland in the mid-1980s when it was adopted by the Ballymena Anarchist Group. There had been individual anarcho-syndicalists active in their trade unions previously, including some Dublin supporters of the (British) Syndicalist Workers Federation in the 1960s, but this was it’s first public appearance. The past three decades can give an impression of there having been numerous shortlived groupings. The reality is that, despite many changes of it’s name and that of it’s publications, there is a continuity of politics and members. Essentially, we are seeing different phases in the development of the one organisation. Membership was initially based on Antrim town and Ballymena. By the late 1980s Belfast had more members and it has remained like that since. Membership has been almost totally north of the border, with just the occasional member in Cork, Kildare and Dublin. saw the creation of Ballymena and Antrim Anarchist Groups. The Ballymena group, some of whom had previously been in the Young Socialists, was in existence for several months before the Antrim group and published two issues of Black Star. 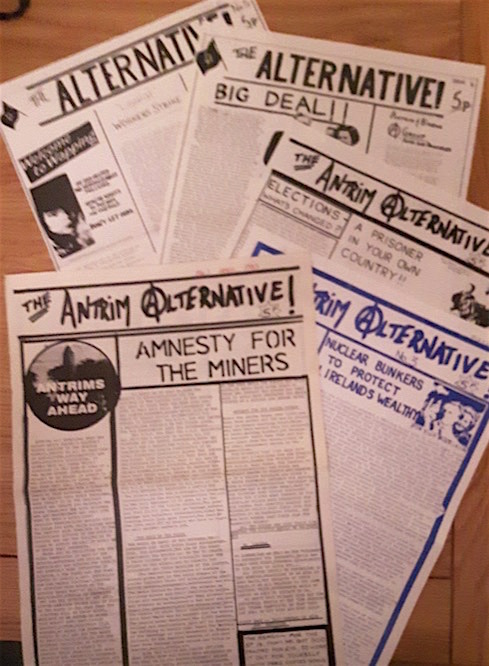 Both groups then went on to jointly publish six issues the Antrim Alternative, with a circulation of 300-500. The Antrim Alternative was succeeded by an explicitly syndicalist magazine, Organise! the Voice of Anarcho-Syndicalism. By late 1986 the Ballymena and Antrim Anarchist Groups had changed their name to Organise! Belfast Class Struggle Anarchist Group – Initially influenced by the British Class War, this small group from the (loyalist) New Mossley and Rathcoole estates, found their definition of working class too narrow. A couple of those involved went on to contact Organise! and were involved in that group’s re-emergence. While still sympathetic to anarcho-syndicalism, it initially described itself as “class struggle anarchist”. Organise! 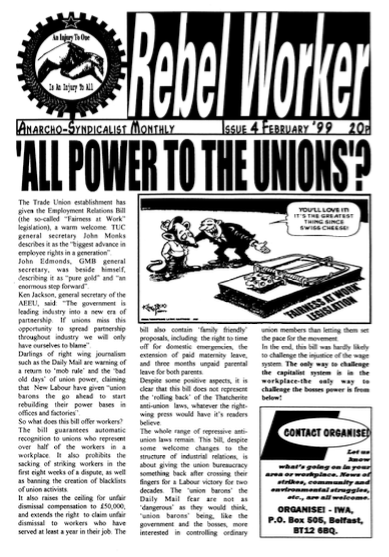 – IWA (publication: Rebel Worker). In this period Organise! 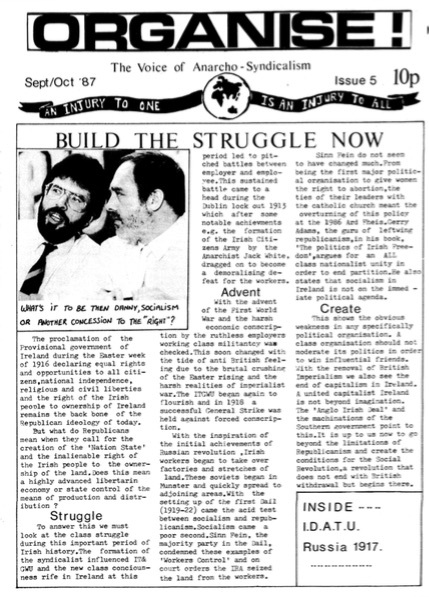 again became specifically anarcho-syndicalist and the name of the bulletin, for a time a magazine, reverted to Organise – the voice of anarcho-syndicalism. 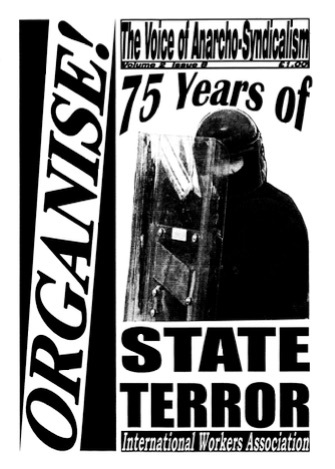 In 1996 Organise! affiliated to the International Workers Association as it’s Irish section. By 1999, with a much reduced membership, it found sustaining local activity and their involvement in the IWA increasingly difficult to maintain, and decided to disband. After the dissolution of Organise!-IWA a series of discussions were held by anarcho-syndicalists under the banner of the Syndicalist Solidarity Network. Those involved created the Anarcho-Synicalist Federation shortly afterwards. 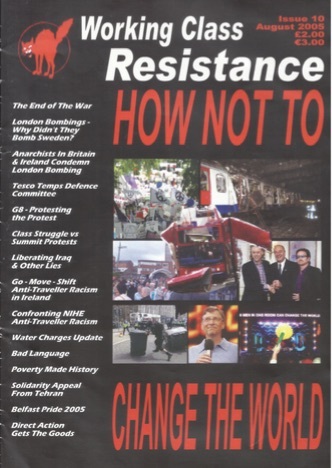 The SSN produced a single issue of Solidarity Magazine. 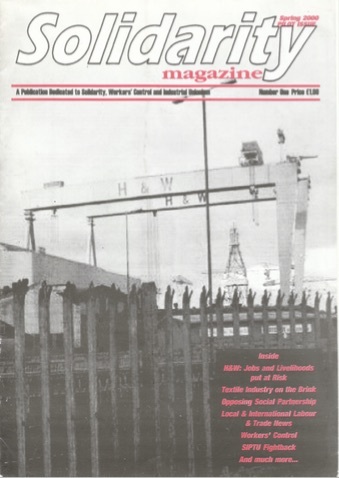 They also produced the Belfast Solidarity Bulletin. The name changed to Organise! 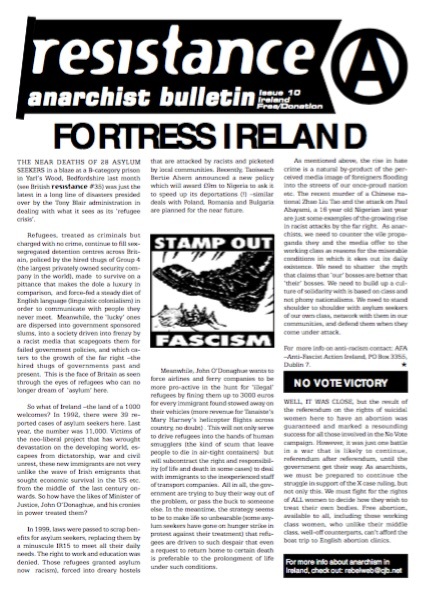 – Anarcho-Syndicalist Federation and they continued to produce the Belfast Solidarity Bulletin. They also put out 2 issues of Wildcat, a joint bulletin of Organise! and the tiny Anarchist Federation (Ireland). The AF(I) was very closely connected to the (British) Anarchist Federation. 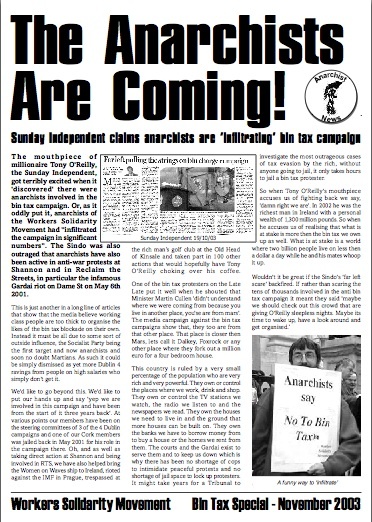 In it’s brief life, the AF(I) -with a scattering of members in Kildare, Dublin, Warrenpoint and Belfast – produced 10 issues of Resistance, before merging into Organise! This version of Organise! initially attempted to build a broader class struggle anarchist federation becoming specifically syndicalist again, probably by 2005. 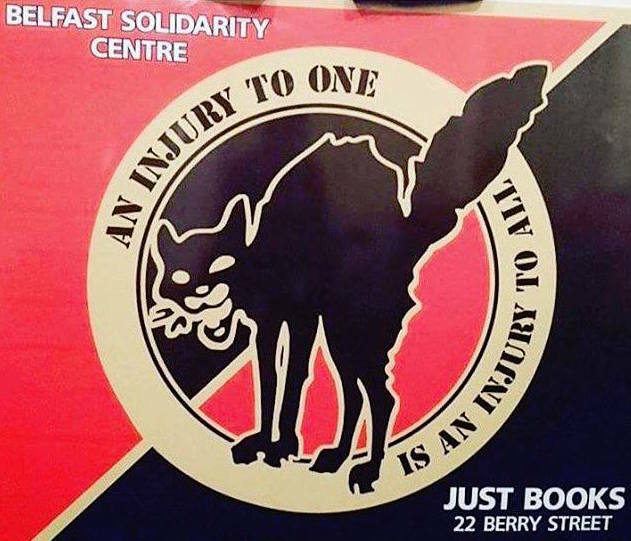 The organisation decided to join the British section of the IWA, the Solidarity Federation, as it’s Belfast branch. Members of Organise! in other parts of Ireland were attached to the Belfast branch. At the 2013 conference of the Solidarity Federation Belfast was formally admitted and its constitution changed so that it was now the IWA section for Britain and Ireland. Irish members reserved the option of forming an independent IWA section in Ireland in the future. Organise! remains the name of the SolidarityFederation (Ireland region). Currently this consists of the Belfast branch, along with members in Lisburn and Portadown. In April 2016 they opened an office/meeting room/library at 22 Berry Street in Belfast city centre. 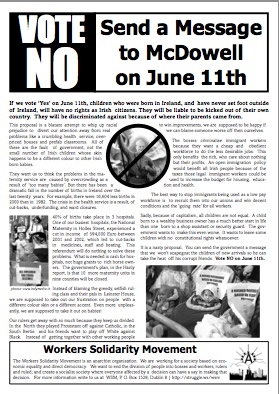 A Workers Solidarity Movement leaflet urging a ‘No’ vote in the 2003 referendum on whether all children born in Ireland would continue to automatically become Irish citizens. 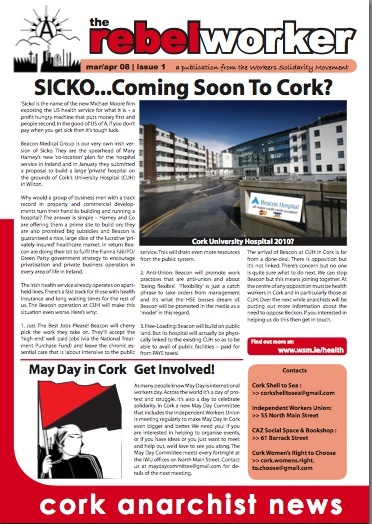 The Cork Anarchist Conspiracy was a local A5 magazine published by anarchists involved with the Cork Autonomous Zone (see page 5). A few were members of the Workers Solidarity Movement but most were not affiliated with any grouping. 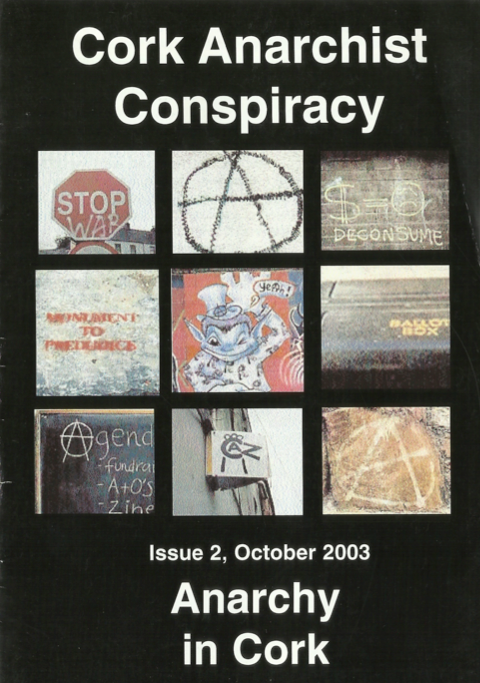 Four issues were produced from 2003 – 2005. One of those involved gave this description: “The CAC was an initiative that brought together members of the WSM and other anarchists / libertarians in the Cork area in this period. It aimed to increase and enlarge the anarchist presence in the city and around. Politically some of those involved were arguing for a more open, less restrictive membership basis for involvement in the CAC – this was very much posed in opposition to the WSM at the time which was viewed by some as being restrictive and dogmatic in a number of respects. The more ‘open’ broader interpretation of what constituted anarchism – that was CAC – was also an organisational formula for those in the group to do more work with one another. 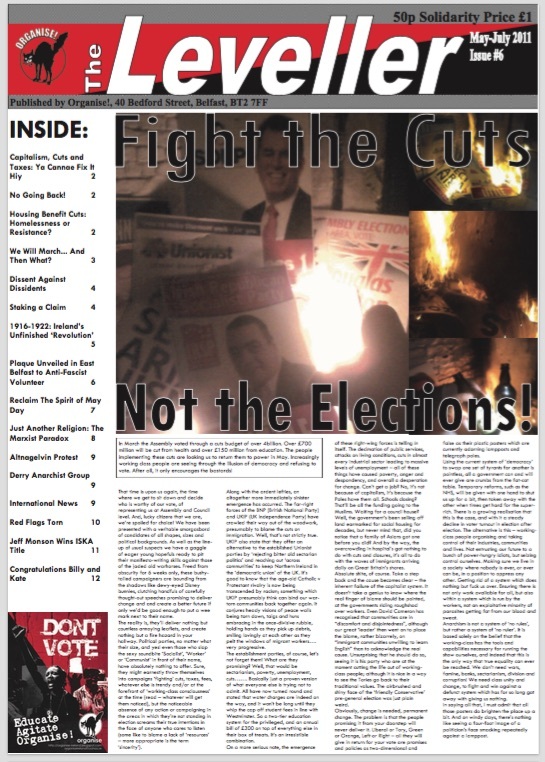 This issue has articles on anarchism, privatisation, the CAZ, Crap Job of the Season (‘Oh Think Twice’ restaurant), Cycling and Wars, Skateboarders on collision course with City Council, and fighting the bin tax. A Workers Solidarity Movement leaflet delivered door-to-door in areas where they had members during the 2002 general election. 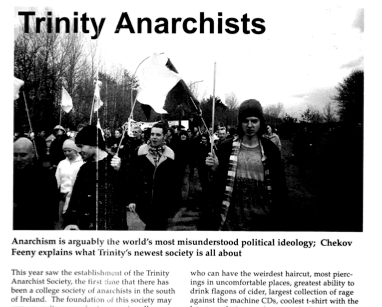 Chekov Feeney of the TCD Anarchist Society wrote this for the student magazine Diversity. The society hosted discussions and film shows, as well as engaging in campus politics. It contained members of the Workers Solidarity Movement along with other students and staff not aligned to any organisation.